My upcoming exhibition has the title “The Dance of Trees” and as a result, I tried different ways to express the moving character of trees. 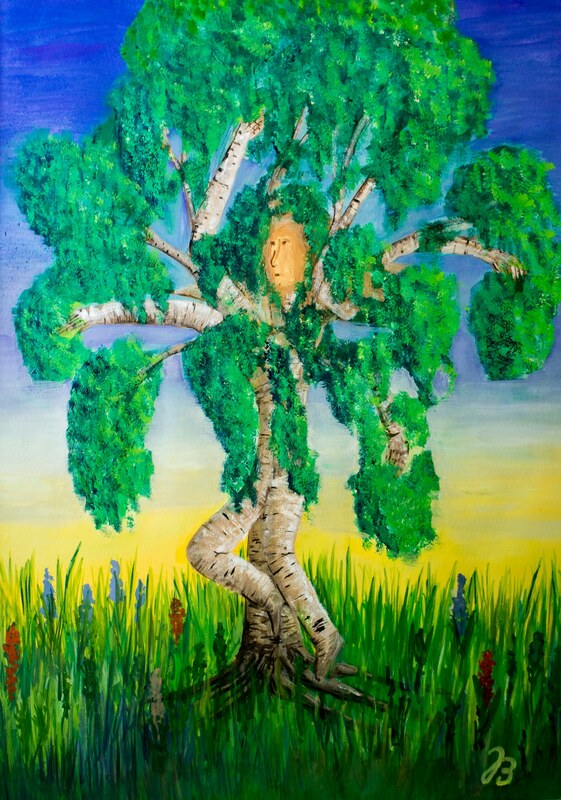 This painting of a birch that dances started out as a self-portrait. During a Christian art congress the participants of our painting class got 30 minutes to paint something that represents them. The dancing birch was the result of these 30 minutes, even though I later went over it in more detail. The title of the exhibition combines two of my loves – trees and dance. I love trees – sometimes I say that I have a “Dogmatix-Soul” because like him I am saddened about every cut tree. Birches (as well as beeches) have a special place in my heart. I sometimes call birches “my sisters”. And of course, I love to dance – that’s why I chose “Faith-Dance” as my artist name. That’s why I felt that a dancing birch would be a good way of presenting myself. I was very moved by the remarks of my classmates as they tried to interpret the original painting because so many things were spot on about me. The original 30-minute painting was done with watercolor; the final painting was done with gouache on top of it. The painting is on a thin matting board, size 20 x 27.5in (50×70 cm). You can buy prints and posters of it here.